No, actually, I’m not a “potential descendant” of Simon Shew. I don’t know how I can make it any clearer in my family tree — and I don’t know that you’d care if I did — but Simon isn’t one of my ancestors. You can put me in as many circles as you want, but that isn’t going to change the fact that — have I said this already? — Simon isn’t one of my ancestors. Now I’m not disputing that Simon’s descendants and I ought to be sharing a fair chunk of DNA. But it isn’t because of even the slightest possibility that I am a “potential descendant” of Simon Shew. It is, instead, because of who Simon Shew’s parents were — and who his wife’s parents were — and the fact that all four of those people are in fact my ancestors while Simon and his wife are not. Let’s look at the paper trail here. Simon and Daniel met and married local girls and were enumerated side-by-side on the 1850 census. By that 1850 census, Simon and his wife Sarah already had three children: Charlsey, age 3; Emily age 2; and two-month-old Nancy. Daniel and his wife Margaret had one child, one-year-old William. So where do I fit in? I descend from Martha Louise. Daniel’s daughter. Not Simon’s. Daniel is my third great grandfather. Simon is my 3rd great granduncle. Their parents — Boston and Elizabeth (Brewer) Shew — are one set of my fourth great grandparents. Any Shew genes that I share with any of Simon’s descendants come from common descent from Boston and Elizabeth. 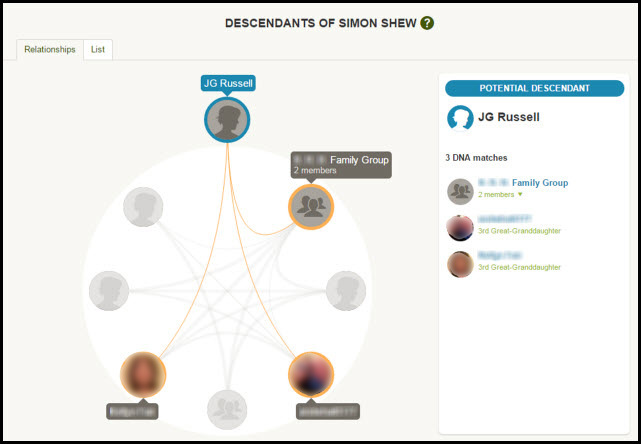 So why am I in a circle with Simon Shew’s descendants at AncestryDNA? Because AncestryDNA sees two things: (1) there are a whole lot of people who descend from Simon who share a whole lot of DNA with me; and (2) Simon is in my tree and in theirs. What AncestryDNA doesn’t see is what’s not in the trees of most of Simon’s descendants. What’s not in those trees is that Simon’s wife is the sister of Daniel’s wife. Sarah (Battles) Shew and Margaret (Battles) Shew were sisters, children of William and Ann (Jacobs) Battles. In other words, all of Simon’s and Sarah’s children were double-cousins to all of Daniel’s and Margaret’s children — and all descendants on both sides can be expected to show a closer genetic relationship as a result. And that in a nutshell is why DNA by itself doesn’t solve family mysteries. Only when it’s combined with the paper trail does it become evidence. So true… I have two of these potential ancestors. One is a suggested 3rd great-grandfather, but actually a grandson of the couple who are actually my ancestors. In the other case, Ancestry has identified the husband of my 3rd great-aunt…but left her out of the equation! I can’t imagine what conclusions I might draw if I didn’t have a paper trail. >> I can’t imagine what conclusions I might draw if I didn’t have a paper trail. Very true! I think the paper trail is the first thing that needs to be completed. There is a difference between “being related” and “descended from” that seems to be on it’s way to being synonymous. And I can already see from my own experiences that family genealogist newbies are looking at DNA as a short cut to building a family tree beyond what they copied from Ancestry family trees. Just like other things that become too automated, skills become secondary. There is a certain individual, “David,” who happens to be a first cousin of a good friend of mine. My Mom and my Dad each share some DNA with him, but, mitosis and meiosis being what they are, I share an even larger chunk of DNA with him than either of my parents. According to Ancestry DNA logic, shouldn’t my parents be pegged as my descendants? Thank you for sharing this. I have an “Ancestor Discovery” that drives me nuts — I share some DNA with some (not all) of his known descendants according to the DNA circle, but there is no evidence for his inclusion in my family tree. But there IS some evidence that his WIFE and her family are related to me… except that these family trees being what they are (more paternal line friendly) the Ancestry algorithm pinpointed the wrong person! Which just goes to prove that a brain is better than any algorithm! Great clarification Judy. As always our research tools have to be critically assessed to determine the correct genealogical outcome. Always, Pauleen. Anything we rely on has to be checked as many ways as possible. That begs the question, what is evidence? I turned to Evidence Explained where on page 822 it is written “evidence: information that is relevant to the problem. ….” Certainly DNA is relevant in this case, it’s the way it’s interpreted that causes trouble. And, does a single piece of evidence ever “solve family mysteries”? Yes, Judy, I too have those double cousins and AncestryDNA is indicating I am kin in very wrong fashion – to the wife to whom I am no kin at all. I really have to wonder at the future of online family trees. Ancestry is so frustrating – both their erroneous DNA connections and the ease of connecting to family trees ad nauseam that have so much wrong. Their ads make it seem effortless – which is true if you don’t care whether those people were really your kin or not. Paper trail, documentation …please! Paper trail documentation with the DNA is best of all, Kay. The point I was trying to make here was that, without the paper trail, DNA by itself can be terribly misleading. If I might quibble with something you wrote: “Only when it’s combined with the paper trail does it become evidence.” Clarifying, you mean “evidence” of the historical (familial) relationship. The genotypes by themselves even without (written) records are evidence – evidence of recent shared ancestors in the case of shared identical regions on chromosomes. John Reid already (correctly) took me to task for that tagline. Anything can be evidence if it bears on our research question; it’s only proof at a certain point in the reliability spectrum. So in this case the DNA is evidence of a relationship, but not proof of this relationship. And this was not one of the New Ancestor Discovery circles (I have those too, now). This was offered as a regular circle. Thank you for making the DNA issue so clear. Thanks for writing this, Judy! I too have had Ancestry DNA do this in my “circles”. The first potential one they sent to me was correct, Isaac White and Sarah White nee Vaughn are my direct ancestors, but I already knew that from previous work. Recently, they have sent me two different names of supposedly related husband and wives that I do not even have the same last names on ANYWHERE in my work (for those generations and for the ones immediately before and after)and I’ve been working very hard on my family tree for the last two years (especially the generations and places around the time that these AncestryDNA Circle individuals are to have lived). I’m thinking, as you did, that possibly these couples had a female that is a relation to one of my direct ancestors/relations, such as a sibling, or perhaps even an Aunt or Uncle of one of my direct ancestors/relations, who married into one of these families and that I have not found that link yet (and may not be looking for it at this time, although I’m getting some great results in general on researching siblings of direct ancestors/relations that are breaking some walls I’ve hit, particularly in my colonial Virginia and Tennessee research, as well as information from the US Census of 1850 and later decades where individual females are listed by name). With luck at least the people they link us to will be relatives of some stripe — even if it’s just to collaterals. Only when combined with an AncestryDNA Circle did it generate false information. You sound like you’re on the right track to me — good luck! In my opinion, Ancestry has done a disservice to solid research with their “leaves” and the ability to attach anything to a tree. I may have a DNA match to two descendants of a man born in NC in 1821, but Ancestry just assumes that because those two people have only one name in common in their respective trees, that man had to be my ancestor as well. Anyone with half a brain knows that most of the trees were copied from one another. I finally put my tree on Ancestry because every other tree listing my grandfather was wrong–it was easy to see that most had copied from one another and had attached “documentation” that didn’t support the connections. So, with only a message from Ancestry telling me about this man in NC and understanding the poor quality of many trees, I was seriously wondering about continuing to look for a connection. I do appreciate your explanation and support. Ancestry trees are both a blessing and a curse. A curse because they’re so often inaccurate. But a blessing because they do often provide a clue we might have missed otherwise. My original name is Shew. There was aproblem along the line somewhere and they changed it to Schew. Why? I don’t know.